There's something a little magical about seeing holiday decorations when you travel, isn't there? 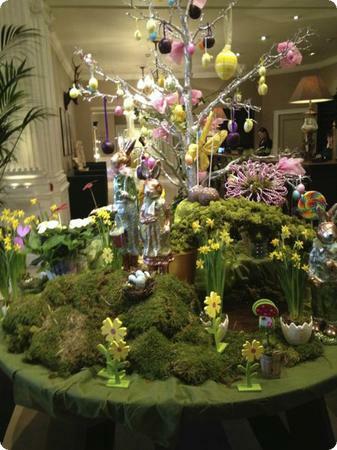 I just loved this Easter table in the lobby of the Balmoral Hotel in Scotland. Alyson on April 18, 2014 at 1:16 p.m. Boy you've been hit hard by spam here! Sorry to see that/, great idea for a link up and we had an INCREDIBLE day today. eileen @ FamiliesGo! on April 21, 2014 at 8:56 a.m.
Glad to see you back. I missed this during your winter hiatus. Dhow Cruise Dubai on May 3, 2014 at 9:20 a.m.
very nice picture i like that picture,, keep sharing and update us. Meghan on May 10, 2014 at 11:36 p.m.
San diego hearing centers on May 18, 2014 at 11:29 a.m.
Mary on June 13, 2014 at 7:43 a.m.
Great picture, I want to go to Scotland! Lowcost on June 21, 2014 at 6:06 a.m. It is great! I think that it is too hard to make such a composition. Christine on September 2, 2014 at 8:44 a.m.
Wow, good on you for traveling so far with your kids. I don't think I have the courage for that.. Great pictures though! Adam on April 19, 2015 at 3 p.m.
Hope Easter this year went well for you and your family!